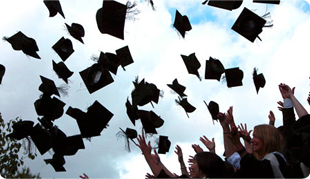 Completing graduation is achieving another milestone in your life. From here onward, (where did the teenage years go? ), you will be looking at embarking on a full-fledged career or further specializing in your chosen field of study. It is a major crossroad in life and at this juncture it is a good idea to pause and review one’s career decision. It may so happen that you are absolutely sure of what you are doing and are raring to get into the job market. Good for you! It may also happen that you may want to study ahead. Great! It may be the case that you are unsure about what you have done and what you want to do. All the more better! Surprised? I say all the more better because it is great that you are having these doubts right at the beginning of your career. It is much better to realize one’s mistakes now and take corrective steps rather than spending half/even the entire of your career mired in self-doubt and frustration. There are many fancy jobs and courses out there in the market which promise tonnes of money. But you do not need to believe those promises if you believe in yourself! Fancy words? No, they are words of wisdom. There are two options for those who are unsure – believe the fancy promises or choose the road to self-discovery. If you choose to walk the road of self-discovery, are you to tread alone on this path? No. Enter the career experts – career counselors! Career counselors will help you understand your strengths, abilities, skills and interests and help choose a career path that best matches them. Choosing a course and/a job after that is fairly simple and will lead to a rewarding career ahead, both financially and work-wise. It is always a good idea to work for a while in your chosen field. It helps one face the truth about work life pressures, forging and maintaining work relationships and much more. It will also help you consolidate which area within your field of work would you like to focus on and do a post-graduation accordingly. In today’s world of severe competition, how does one stand out in a crowd. Even if you may be in the right field with the right skills, it takes hardly any time for knowledge to become obsolete with advancement in technology. It is therefore wise to look at doing professional certifications/diplomas that will help you progress in your career. Here again, you may choose to do a full-time course or pursue a part-time course along with working or work for a while and take a break to do the course. Irrespective, a professional course is an added bonus. In fact, it is a good idea to keep upgrading one’s knowledge base all through one’s career to stay on top of things. Doing a post-graduation in your chosen field is always a good idea. While a Bachelor’s degree introduces one to the general principles of a domain, a Masters degree helps one gain expertise and specialization in focused area within the domain. If your situation is such that you are able to invest time and money in a post-graduation, immediately after graduation, then go full steam ahead! Even while pursuing any one of the above mentioned options, you can still choose to prepare for civil services/armed forces/banks. Let me re-iterate, whatever you choose to do must be based on a thorough understanding of your abilities, interests and skills and depending on your present situation, economic and otherwise.